Securely store your compact handgun and other valuables at home, in the car, or while traveling. 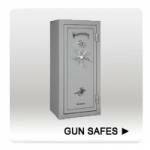 18 gauge steel construction with extra heavy 12 gauge reinforced side and bottom plate allows these vaults to be secured to any flat surface with the included hardware. A heavy duty 43", 1500lb steel cable is included and allows the vaults to be secured to a stationary object or the internal frame of a piece of luggage. Secure to a nightstand, bedframe or inside your vehicle Meets TSA airline..
Use to display your firearms on a wall, or use to conceal your handgun under your desk or in another accessible location in a time of need. Works on most handguns and revolvers, or use two magnets for rifles and shotguns. Coated in non-marring rubber, your gun stays protected. Includes wood screws, drywall anchors and magnetic mount. ..